That was the verse we chose as the theme for our wedding so long ago. 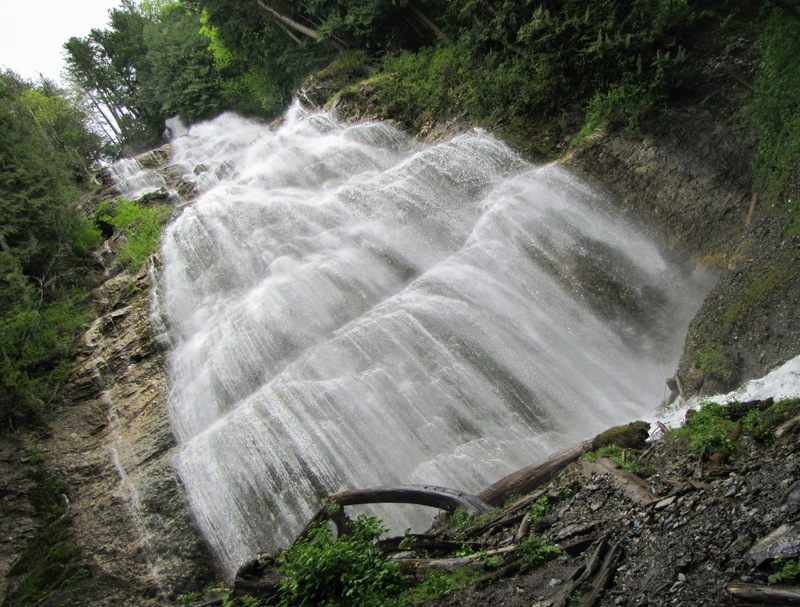 Bridal Veil Falls is a place we have visited many times throughout the years. Today it is a reminder to me that 'many waters cannot quench love'. Love is what keeps a marriage going...gives comfort in the tough times, ignites laughter and joy and provides refreshment. Jesus was the ultimate example of what love should look like. He loved even when He was rejected. He pursued us...found us...and gave His life for us. That is the kind of love we need in our marriages. Love that will go to all lengths. Love that will prevail in good times and bad. Forty years ago today we took our marriage vows, before God and our family and friends. We were filled with hopes and dreams and never gave a thought to the 'many waters' that would come our way. 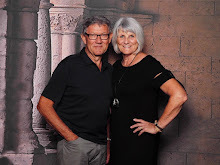 They came...in the form of crop failures and financial worries in the early years...through a serious car accident that changed the course of our life in many ways...and with death and disappointments within the family. Though there have been many challenges and hardships along the way there was none so great that it could sink our marriage. 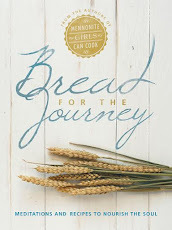 We were always aware that we were not on this journey alone, that God was in control. Through the good times and the bad, God has been there for us. Though we didn't wish to go through the rough waters, our love and faith have been strengthened by those very things. Today I am most thankful for a wonderful and godly husband with whom I have been privileged to share forty years of my life. Forty years is not the end of the road but a milestone to be celebrated along the way. We know there are bound to be more 'rapids' up ahead and we plan to let God help us navigate them. Today we thank Him for bringing us safely this far. Great is His faithfulness! This meal/salad can be served, using warm rice and chicken, as an all in one dish meal serving four to six OR taken chilled to a potluck. 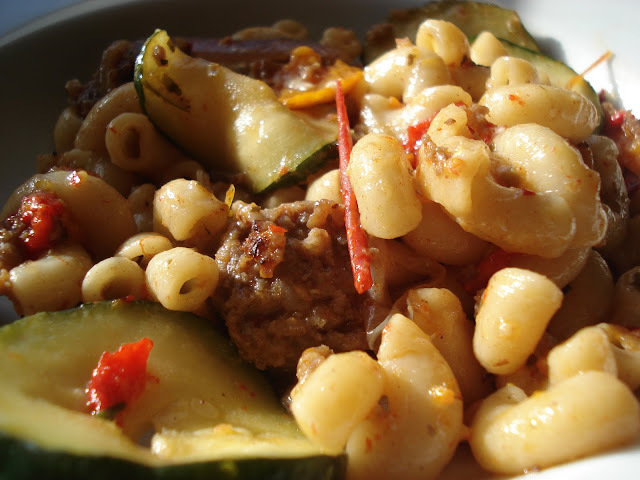 Canned artichokes can also be replaced with roasted red pepper, omitting the fresh red pepper. Combine dressing ingredients in a small container with a lid and shake well. Set aside. 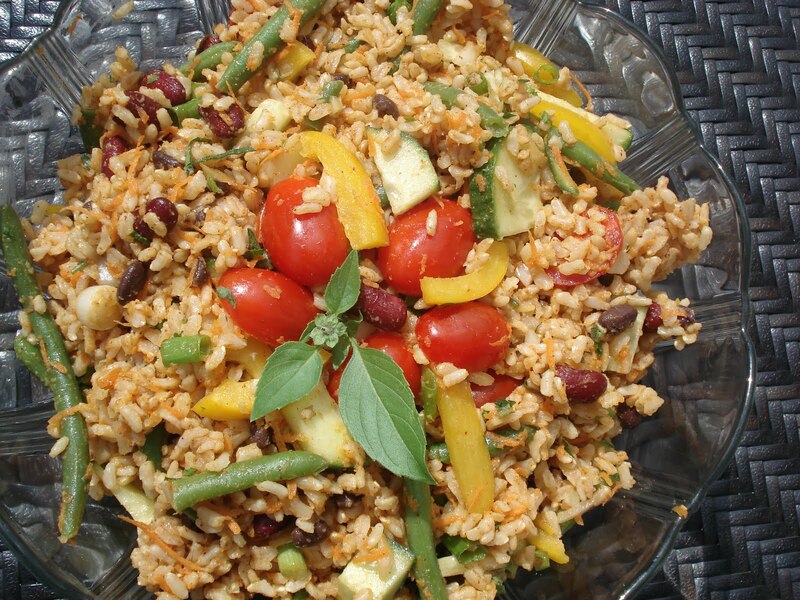 In a large bowl, combine rice, chicken, artichoke hearts, red pepper, avocado and parsley. Add dressing and stir gently to mix. Garnish with parsley. Store in airtight container in refrigerator. Fresh baked focaccia bread slathered with a pesto and mayo, topped with a chicken breast fillet, roasted red peppers, smoked aged cheddar and fresh baby spinach. This Tuscan style rustic sandwich is loaded with flavour! I use Anneliese's french bread to make my focaccia bread. Mix in order given, mixing the yeast with a little flour and adding that while dough is still very soft. Add enough flour to make a dough that holds together in a ball shape and is not sticky if you handle it with floured hands. Cover. let rise until double, about 1/2 hour. Line a large (12x18") cookie sheet with parchment paper ( I lightly spray the paper with Pam which helps it come right out after baking) and press all the dough into pan. Brush top of dough with 1 tbsp of olive oil, and sprinkle with the following mixture. Using your fingers poke the dough all over giving it a bubbly look. Allow to rise another 30 minutes and then bake at 400º for approximately 15 minutes. Slide it out of pan and off of parchment onto a cooling rack as soon as it comes out of the oven. Place chicken breasts between wax or parchment paper and pound until they are thin. Drizzle 1 tbsp olive oil into a 9x13 glass pan and lay chicken in pan in a single layer. Top each breast with 1 tbsp pesto and 2 strips of roasted red peppers. Bake uncovered at 350º for 25 minutes. Using a sharp bread knife cut 4 large square pieces of bread the size of your chicken pieces. Spread both sides with mayo and pesto. Lay a hot chicken breast along with the pesto and peppers onto bottom half of bread. Top with a thin slice of smoked cheddar and a mound of fresh baby spinach. Place the herb topped piece of focaccia on top and serve while it's hot! You will have lots of bread left over if only serving 4 people. It freezes well. Wrap in parchment and then in a freezer bag. I wrap it in parchment and then foil to reheat once thawed. This bread is perfect for dipping in olive oil and balsamic vinegar. This is my favorite coffee cake recipe which I asked for politely and received from my daughter Alison. Then I went and tweaked it a bit. I made it often for our staff and found it disappearing real quick when coffee break rolled along. I miss those days, maybe I should find another coffee room to supply with baked treats. Cream butter and sugar, add eggs and mix well. Whisk in sour cream and vanilla. Combine flour, baking powder, baking soda, salt, and stir into the creamed mixture until blended. Pour half the batter in a greased bundt or angel food pan. Sprinkle with half the topping. Spoon the rest of the batter over the topping and sprinkle with the rest of the topping. Bake in a 350º oven for 45 to 50 minutes, or until toothpick poked into cake comes out clean. Grease two cake pans. Line with wax paper cut to fit bottom. (Use pan to draw template) Grease wax paper too. Preheat oven to 350╚ F.
Blend mayonnaise and sugar, using wooden spoon. Stir in the water and then the flour combined with the rest of the dry ingredients. Bake 25 - 30 minutes, let stand for 5 minutes, then invert onto cooling rack and peel off wax paper. Beat whipping cream with instant pudding until well mixed and thick, then add up to 1/2 cup milk for nice spreading consistency. Invert the rounded part of one cake into the dip of a plate. Spread with a fair amount of whipped pudding. Top with second cake, rounded part up and frost with the rest of the pudding. I used Jell-O chocolate fudge instant pudding mix in the frosting, white chocolate pieces and raspberries for garnish. It's that time of the year...when the avid fishermen begin to reel in the salmon. Though we aren't that big into fishing at this household, we have friends who keep us supplied. And we have a new smoker that is turning out wonderful smoked salmon. Hubby eats it like candy! We've found smoked salmon pairs beautifully with pasta and a herbed cream sauce. Sauce: Cook onions and garlic in hot butter over medium heat until tender but not brown. Stir in sliced zucchini and stir-fry for another minute or two. Stir in flour, salt and pepper. Add milk. Cook and stir until thickened and bubbling. Over low heat, add cream cheese and stir until cheese is melted and sauce is smooth. Add salmon pieces and herbs heat through. Most of us can rememeber a very special birthday ..the one we said. ."this was my best birthday ever". Think back to the most precious birthday gift you have ever received. It might have been a shiny red bicycle when you were but a child. ..or a carefully thought out gift of time. Perhaps you have been given something incredibly dear. ..something money could not replace. If you have such a special memory you will understand how my beloved felt yesterday when he held our brand new grandson born early in the early morning to share a birthday with him. This new little lad not only shares a birthday with his Grandpa. . .he also bears the name of his Great Grandpa . .my beloved's Dad. Dad passed away when our son was fifteen years old. Our son has been without his Grandpa longer than he had him in his life but the memories and the legacy he left are still clear. It struck me yesterday afternoon . .
that we have one lifetime to leave a legacy that speaks of the greatness and mighty acts of our Heavenly Father. If we praise our Father and bless his name forever and ever. . .
indeed the next generation will remember. Lord, thank you for the blessing of a new life. Help us as grandparents to take every opportunity we have to speak truth and love into this childs life. Please grant us wisdom to teach him and model for him a life that is honoring to you. Pork Ribs or "Pig Ribs" as my 7 year old grandson calls them, are a huge favourite in our family. 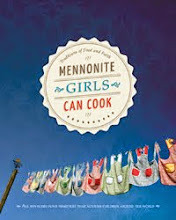 However if they are under cooked, the meat is tough, and if overcooked, it can be dry. You can boil or roast the ribs before adding the sauce but we've recently come across another method that we prefer. It seals in the juices and results in perfect ribs. Our good friend Wilf is the source of the awesome sauce recipe. Sear pieces on very hot BBQ until browned and juices are sealed in . If your BBQ is very hot this will take about 15 minutes or so. Ribs can be refrigerated overnight at this point if desired. The day you want to serve them, Heat oven to 375 degrees F.
Pour sauce over ribs and cover tightly with foil and lid. Bake for 1 hour at 375 degrees F.
Baste and reduce heat to 325 degrees F.
Bake for an additional 3 hours, basting occasionally. Ribs are done when the meat pulls away from the bone. Note: you can play with the ingredients – substitute bourbon for the rum or add more garlic, etc. It's finally here. I found the secret to creating a perfect crust. Back a few weeks, we went to Lepp's Farms to demonstrate pie-making. I think that I learned more than most of the quests that evening. So many of the MGCC ladies shared practical hints that totally made sense. Over the past years, I've been very frustrated at not attaining a perfect pie crust that would not shrink. I had actually given up until I did a google search and found this wonderful method. I was ecstatic, as I shared this news with my walking partners the next morning and yet, they smiled. Seemingly, they seemed to know about this method. Then why didn't any of these ladies ever share their secret? So later that evening while we were sharing tips about pie making, Judy came to me and said, "I used that method today to make sure my crust would not fail, only I used teaspoons as weights." You need to run over and sample Judy's fresh Raspberry Pie. Meanwhile, I did some more research and noticed that Lovella also had her own 'No Shrink Fool Proof Pie Crust' method. Lovella uses aluminum foil. 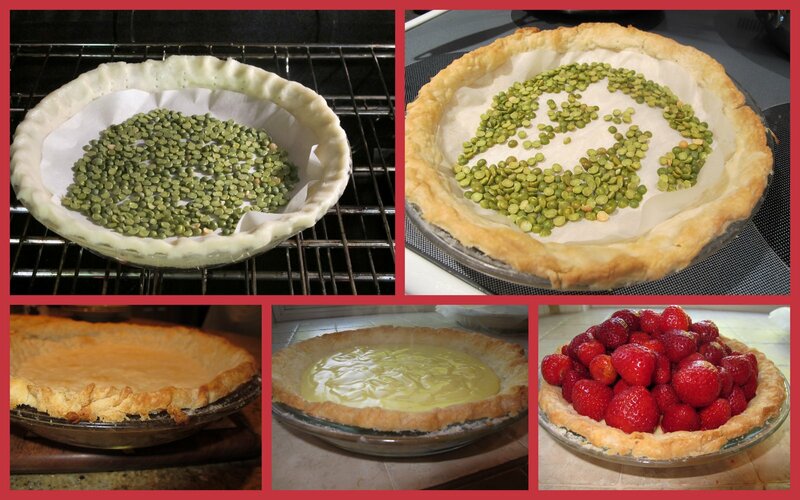 Check out her favorite Dorothy's Pie Crust recipe and you will see her method. Anyways, as you all know, there are so many different ways to make or cook pies, but it's always fun when you can find something new that is foolproof. Scatter pie weights, or spoons, or beans or split peas, over the parchment paper. (in other words, a weight that will not burn in 5 minutes). This helps the shell to retain its shape. The shell should be baked at 400 degrees for 8-10 minutes or until the fluted edge is a golden brown. The weights and parchment should be removed after 5 minutes of baking, and then continue to bake the remainder of time or until golden brown. One word of caution, don't spill the beans/peas when you try to lift out the parchment paper. Ease it in without stretching, and to bake it empty, just line with aluminum foil pressing it against the edges, and bake it for 10 minutes. Remove the foil and bake until brown. Cool. Hopefully, this will be helpful for some of you and don't forget to share these tips with your friends. roast up tender and sweet with just a hint of spice. 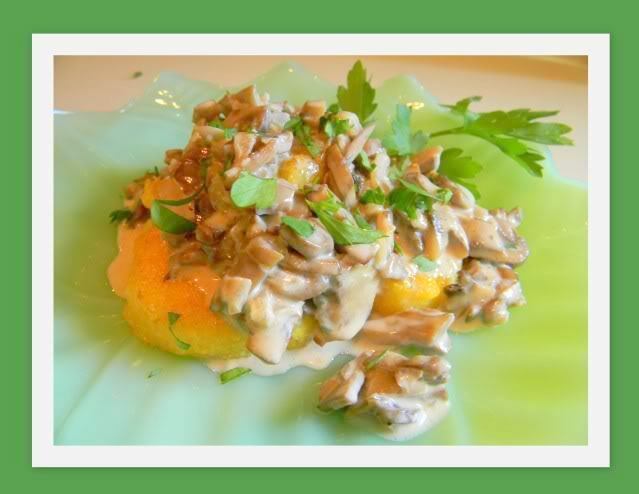 A pretty presentation and a good source of vitamin C.
Slice acorn squash into 3/4 inch rings. Using a sharp pairing knife remove seeds and membrane by running knife around circle. Place rings on parchment lined baking sheet in a single layer. Roast in 400º oven for 10 minutes. While roasting combine all other ingredients in a small bowl. Brush half of the glaze onto rings and roast another 10 minutes. Take out and turn rings over, brush with remaining glaze and roast another 15 minutes. We have been enjoying fresh lettuce out of our garden this summer. add the lettuce leaves and then transfer it to the other clean sink filled with cold water. Once it is clean, I put it in a salad spinner and store what we can't use for one meal in a zippered bag. 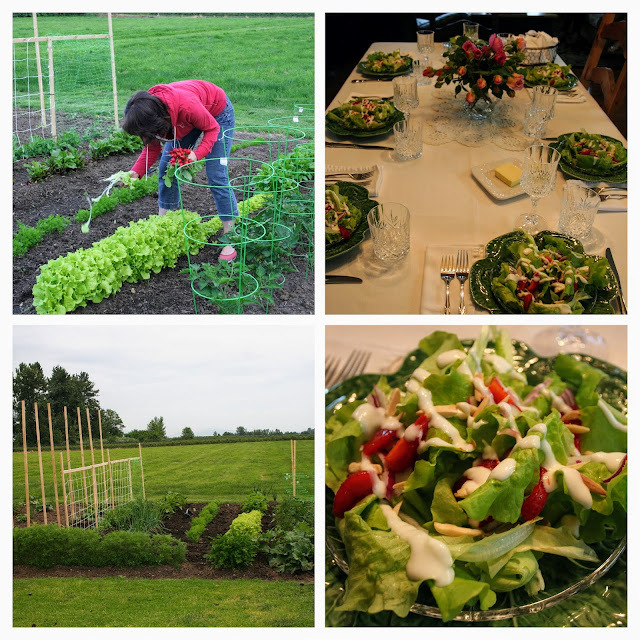 Arrange fresh garden lettuce on each salad plate. Divide the almonds, onions, and berries evenly between the plates. Combine the sour cream, vinegar, and sugar. Put in a squeeze bottle and drizzle over the salad. This will ensure that every bite has a bit of dressing and will allow the salad to remain pretty to the last bite. My daughter and her husband recently moved into a house with a large yard. They were quite excited to learn how to grow a beautiful lawn and spruce up the old beds. It was a lot of work, but they were quite happy with the initial results. It did not take long and she started complaining about the weeds that were coming up. “Why is it, that we have to give so much attention to the plants that we want to grow and yet, these weeds just come from nowhere and take over?” she asked. And then she told me how this had been a spiritual lesson of sorts for her. In the parable of the sower (Matthew 13) Jesus told of a farmer who threw his seeds in the ground, not all of which grew to produce fruit. Thorns and thistles grew up all on their own to choke out the good seed. It is frustrating to see that just like the weeds, sin needs no encouragement. It can pop up in the most unexpected places and take over. 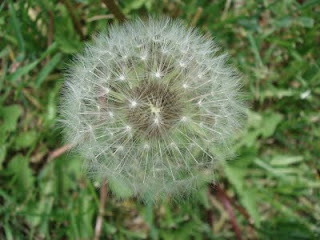 It’s a part of our fallen world in which we need to be alert and ready to weed it out so that the good seed can grow. I’m not a gardener, but this is one thing I know . . . weeding just gets harder if you ignore it. There is something about tilling the soil in order to produce good fruit. Lord, allow me to recognize the weeds and the thorns that choke the good seed in the soil of my heart. Help me to be persistent in allowing You to weed and water for a good harvest. I love anything made with lemon. I went looking through my recipes and decided on these lemon cookies that taste a little like shortbread with a burst of lemon zest. They are pretty and delicious, perfect to serve with a cup of coffee. Using your mixer, beat butter and sugars till fluffy. Add egg, lemon zest and juice, and coconut extract. Beat until combined. Cover and chill dough in fridge for 45 minutes. Shape dough into balls and place on parchment lined baking sheets. Make an indent in each cookie and fill with lemon curd or jam. Bake in a 350º oven for 17 minutes or until edges are lightly browned. Cool on rack, sprinkle with icing sugar and serve. Nanaimo Bars are apparently British Columbia's all time favorite sweet treat! They are a no-bake, three layered bar with a crumb base, butter cream filling and glossy chocolate topping. Everyone loves Nanaimo Bars, so it seems. We celebrated some family birthdays yesterday...and enjoyed this ice-cream dessert as the birthday cake. 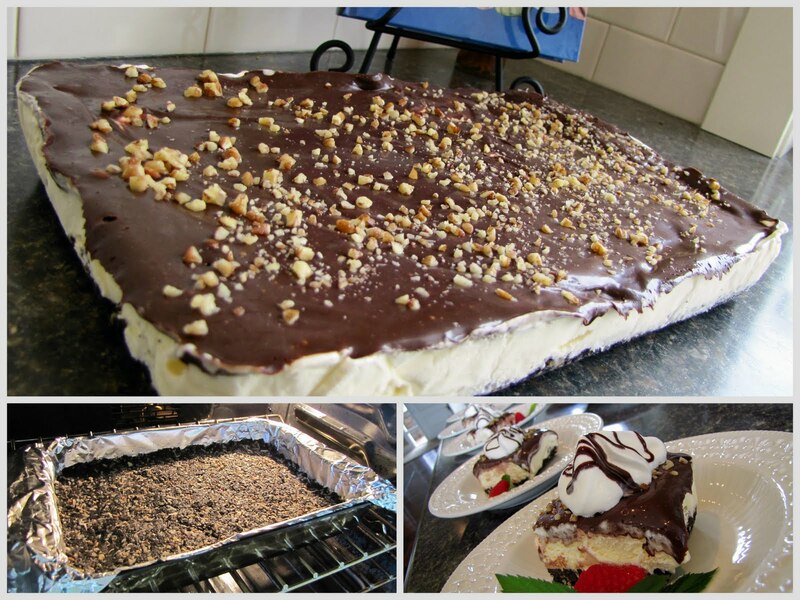 It is an adaptation of the famous Nanaimo Bar and seemed to be a hit with all...so I'll share the recipe with the rest of you! Prepare 9" x 13" pan by lining with heavy foil, leaving a 1-inch overhang at each end for handles. Spray with cooking oil. In saucepan, melt butter with sugar over medium heat. Stir in egg yolks, cookie crumbs, 1/2 cup pecans and coconut. Press crumb mixture firmly into pan. Bake in 350°F oven for 20 minutes or until firm. Cool completely. Soften ice-cream in refrigerator for about 30 minutes. Spread and pack evenly over crust. Freeze at least 4 hours or until solid. Combine cocoa, butter, sugar, cream and vanilla in small saucepan. Heat and stir over medium heat until boiling. Remove from heat and cool about 20 minutes (until lukewarm and slightly thickened). 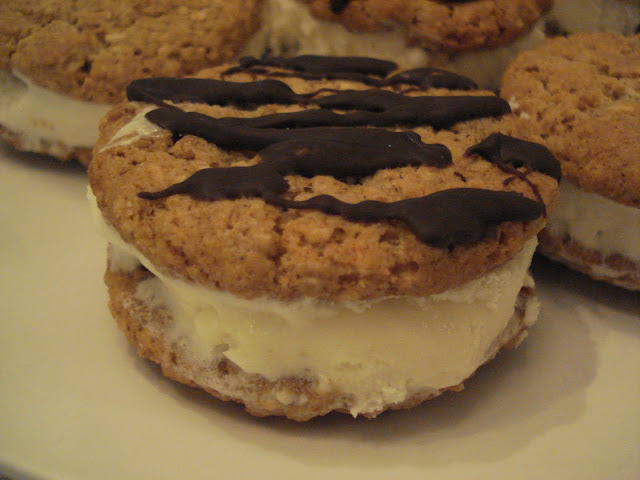 Then spread evenly over ice-cream layer. Sprinkle with additional chopped pecans. Freeze for at least one hour or until firm. To serve: Allow cake to stand in refrigerator for about 30 minutes to soften. Use foil handles to remove cake from pan. Using a sharp knife dipped in hot water, slice cake. Top each slice with whipping cream and chocolate syrup. Note: This cake can be made well in advance, wrapped in heavy duty foil and plastic wrap and stored in freezer. in a marinade of pure maple syrup and soy sauce. lay it all on a bed of fresh mixed greens. The remaining hot marinade in the foil becomes the dressing. just a few helpful hints. Pour 1 cup pure maple syrup and 3/4 cup soy sauce into a zip lock bag. Add the salmon fillets, and place in the fridge to marinade for up to 1 hour. Place fresh spring mix salad greens on a platter. Add a sliced avocado and if you have, some fresh chives. Make a pan out of doubled tin foil...or use a purchased foil pan. Place salmon with all the marinade into the pan and place on hot grill. In a shallow pan drizzle 6-8 asparagus spears with olive oil and a few grinds of salt and pepper. Lightly flake salmon with a fork to see if it is done. Do not over cook salmon...it will be dry. Place asparagus on grill for about 3-4 minutes, rolling over with tongs to get grill marks on all sides. Add bread to grill the last several minutes, flip to grill both sides. 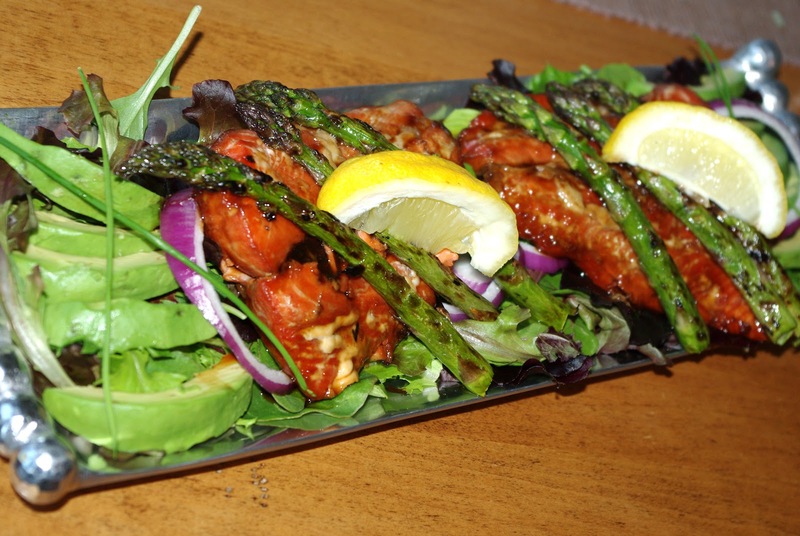 hot marinade that is in the foil over salad. The other day was one of those days that I had not really planned for the unexpected and now I had to get a meal ready in a short time. So what did this cook do when she scrambles around the house looking what is left in the fridge the day before grocery shopping day....she improvises. This meal was so good that I thought I better write down what I did before I forget. 1/4 cup Sun dried Tomato Salad Dressing, enough to moisten the dish to you satisfaction or depending on how much pasta you have and how moist you want it. Cut the Sausage into chunks, cook until it is browned to your liking. No need to add oil, there is way to much in the sausage as is. I start it in a bit of water to help the process along. Drain the fat really well. (Turkey Sausage has less fat). Mean while cook the pasta, any shape, any kind. Once the sausage has browned add all the veggies and cook until tender crisp. Stir in enough dressing to make it moist and sprinkle with desired amount of cheese. Put the lid on the pot, take the pot off the heat, and let the cheese melt for a few minutes while you make the salad. to give him some meal ideas and cooking tips. 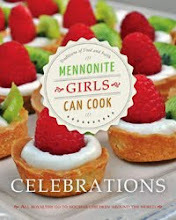 Then, a couple of years ago I was asked to teach a cooking class at a church ladies event. there often isn't time for planning meals. You get home after a day of non stop activities and are faced with nothing in mind for dinner. In today's post, I thought I'd just give you a reference list of meal ideas and then over the next while I'll fill in a few details to the items on the list. Using the comment section, let me know what your standbys are and I'll add them to the list. 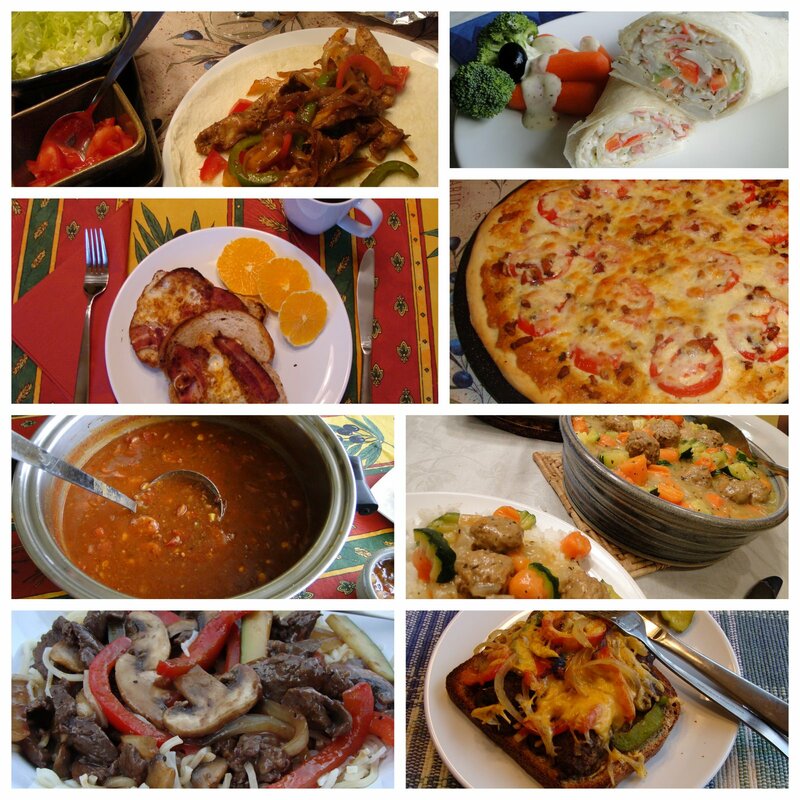 top with pork & beans, chili, spaghetti sauce, broccoli in cheese sauce, etc. sauces or even a can of soup. Nachos – easy as 1,2,3. Tortilla chips on a pan, toppings like sliced black olives , pre-fried bacon or hamburger, chopped peppers, onions or tomatoes and CHEESE. Broil until cheese melts. of lettuce and tear into bite sized pieces). Add any type of chopped raw vegetable, sliced deli meat or cubed cooked chicken, and shredded cheese Add the dressing of your choice. Breakfast items - who says that pancakes, bacon and eggs are only breakfast food? Maybe today was one of those days when you forgot to take meat out for supper and now you're in a panic to feed that hungry family. Instead of going out, choose something from the list. This dip has been around for years. I don't know where it originated. There are only 2 ingredients. It is a delicious dip for strawberries or other fresh fruit. Beat the cream cheese till fluffy. Add 1 jar of marshmallow cream and mix well. 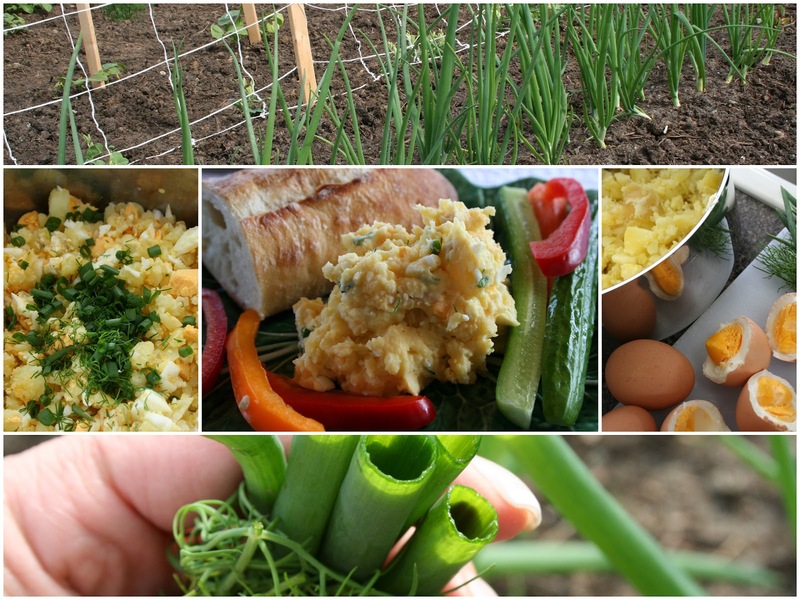 If you need a Potato Salad in a hurry but are hesitating to get started because of all the steps involved and the time it takes to chill. . . this quick salad is for you. There is no getting around the need to boil potatoes and eggs separately but once you have finished that. ..it is a quick slice through with a sharp knife and it's on the table in no time. The one thing I find about this potato salad is that it keeps really well in the refrigerator for a few days. Scrub the potatoes clean and cut into 6 pieces each. Cover with water and add one teaspoon of salt and bring to a boil. Simmer 20 minutes or until tender. Start the eggs. Drain the potatoes and use a sharp knife to mash/slice the potatoes into small pieces. The result will be somewhat mashed. Cover eggs with 1 inch of water and bring to a boil. Once the boiling begins, cover with a lid, remove from heat and let sit 20 minutes. Drain and let cold water run over the eggs for a minute. Use a sharp large knife to cut through the middle of the egg and scoop out the egg adding to the pot of potatoes. Chop in with your sharp knife. Add the remaining ingredients. ..stir well. Chill until serving or serve immediately at room temperature. We've had imported apricots for a while but as soon as the local ones are available, it's a good time to cook up some jam or freeze them for Platz in the winter. 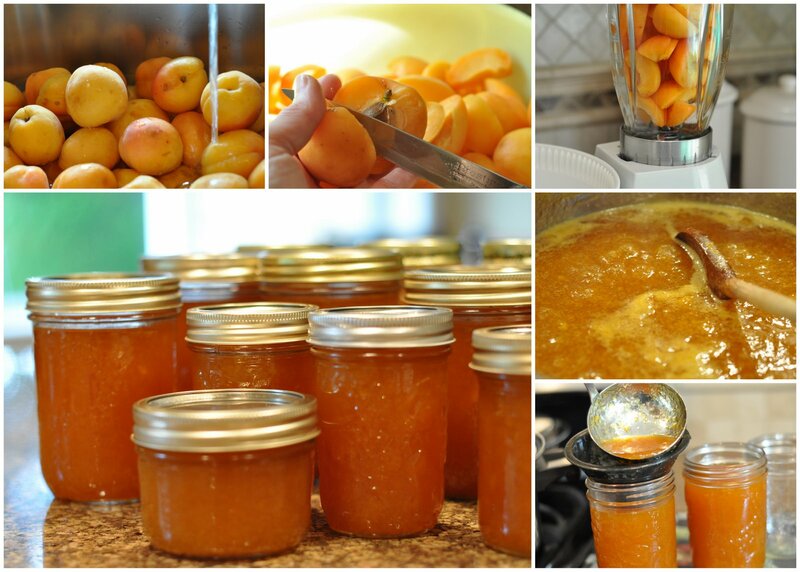 Apricots are easy to work with since they need no peeling. Wash 24 (1 cup) or 12 (2 cup) jars and sterilize in 225° F oven for 10 minutes. Keep warm until needed. Heat rubber lids in boiling water and keep hot. Wash fruit. Remove small stems and pits as you quarter the fruit. Blend until just crushed. If the blender needs a bit of liquid to get going, add a small amount of water to first batch only, then leave a cup of blended fruit in the blender (to add to) for each consecutive blending batch. You should collect about 18 cups of blended fruit, yielding 3 batches. In a medium sized bowl or 4 cup measuring cup – measure 4 cups sugar. Set aside. In a large stainless steel pot, measure 6 cups crushed fruit and 1 Tbsp lemon juice. Add 1 ½ Tbsp Certo light (or ½ pkg regular/generic pectin) mixed with 1/2 cup sugar. Place on high heat, or slightly less. Stirring the whole time (with wooden spoon) bring fruit to a hard boil – so that it still bubbles while stirring. Add the 4 cups sugar and continue stirring until it boils hard again. Listen for the soft sound of the boil to know when to set timer. Continue the rolling boil for 2 minutes, while stirring. If it splatters, turn down heat a tad. (An element with inconsistent heat will make it worse.) If it foams, add ½ tsp soft margarine. Remove from heat and continue to stir for a minute or two. Ladle into hot jars to ½ inch from the rim. (using a canning funnel, makes it safer and easier) Cover with hot lids and screw rings on. Repeat with next batches. After cooling - refrigerating or freezing the jam will keep it fresh tasting longer. Not necessary to seal jars if you freeze them. I had this salad at a restaurant and wanted to try my own take on it. I found a similar recipe on food.com and adapted it to my liking. It's a delicious salad that would be great to serve at a luncheon. The crispy warmed goat cheese rounds, slices of pickled beets and toasted walnuts were a delightful addition. The dressing is tangy with a touch of sweetness. The following recipe serves two but can be multiplied to serve any amount of guests. 140 grams (approx 5 oz) fresh goat cheese log, cut in half inch rounds. Whisk together ingredients until well blended. Mix bread crumbs with salt and pepper to taste. Drizzle olive oil over the crumbs, just enough to dampen the crumbs. Mix well and spread on a baking sheet and toast in a 375º oven for 5 minutes. Remove from oven, allow to cool a bit, then add chopped fresh basil. Brush the goat cheese rounds with olive oil and coat them with the toasted bread crumbs. Bake in a 375º oven on a parchment lined baking sheet for 6 minutes. Prepare 2 plates of mixed salad greens. I was happy to be able to pick fresh greens from my `salad bowl` on the deck. Arrange beet slices, sprinkle walnuts, and drizzle dressing on the greens and place 2 crispy warm goat cheese rounds on each plate. Serve immediately. Happy 4th of July to all our U.S.A. Readers! I'm sharing this old time favorite recipe that has been circulating for years and that many of you might be familiar with. This is a picnic, potluck and barbecue favorite! Bring 1 cup sugar and 1 cup Karo light syrup just to a boil mixing well. Take off heat and add 1 cup peanut butter and mix till smooth. Add 6 cups Rice Krispies and mix till all the Krispies are coated well. Put this mixture into a well greased 9×12 pan and press down evenly into the pan. Empty chips into microwaveable bowl and microwave at 3-30 second intervals, mixing well after each 30 seconds. You can use the double boiler method to melt your chips if you prefer. Pour entire mixture on top of the pressed down Rice Krispies and spread to cover. We want to wish all the Canadians a Happy July long weekend celebrating Canada Day, and our American friends a happy July the 4th weekend. We live in privileged countries, were we are able to still worship in freedom. That is something we can never take for granted, and I am so grateful that I live in Canada. I want to pray a prayer for you all as you celebrate this long weekend. No matter what you are doing, splashing at the beaches, lounging in the warm sun, BBQing with family or friends, or maybe you are the one that is working, waiting for your turn to be off a weekend. Perhaps you are facing difficult circumstances in your life, you are not forgotten, nor are you alone. May the Lord our God, sustain you and strengthen you. May you remain faithful to God so His unfailing faithfulness to you upholds you. May His love for you, draw you closer to His heart, every day. for the work He has called you to do to fulfill His purpose in your life. God's richest blessings be yours, now and always. Aah, the lazy hot days of summer. Make the time and find ways to just slow down and enjoy the moment. That is the way it should be in the kitchen also. My friend made these and had them in the freezer on hand just so it would be easy to pull out and have a nice treat in a moments notice. 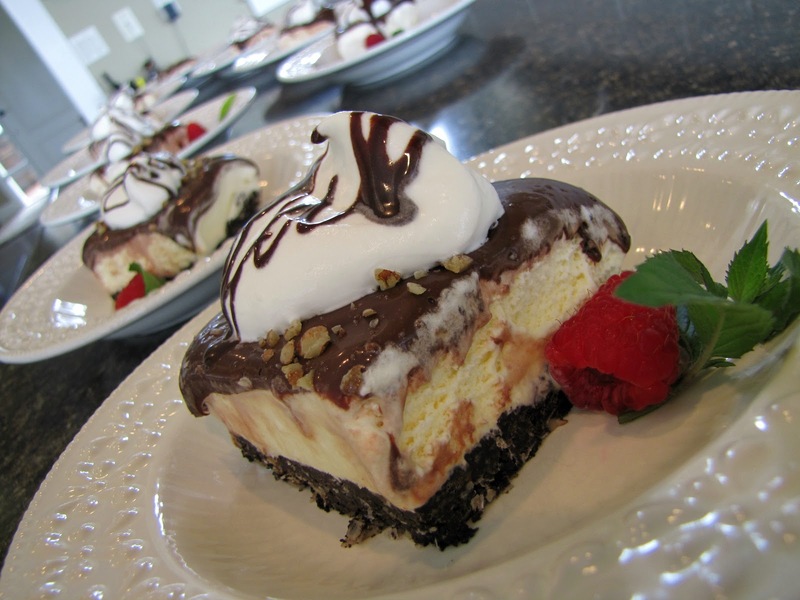 There are lots of freezer ideas for dessert to have on hand to avoid last minute preparations which is great for the summer, just check out our recipe index for more ideas, like mud pie, or drumstick cheesecake.....hmmmm. Enjoy the long weekend everyone! Combine the melted margarine with the sugars til fluffy. Drop by spoonful on cookie sheet and bake for 12 - 14 minutes. This is a large recipe and makes about 8 dozen cookies. Scoop favorite ice cream on to cooled cookies and drizzle with some melted chocolate to make them look pretty. Freeze until you are ready to eat! Today Canada is 144 years old. Many years ago Canada belonged to Great Britain, but on July 1, 1867, Queen Victoria approved a plan to make Canada an independent country with it's own government. Up until 1982, Canada Day was known as Dominion Day. In 1982, Parliament passed an act changing the name to Canada Day. Let's welcome Prince William and Kate, the Duke and Duchess of Cambridge to Canada. They boarded their flights in classic black suits. It will be fun to see how many different outfits she will sport over her time in Canada and yes, most of us will enjoy watching the new royal couple. I'm still feeling a bit ripped off that they did not add Vancouver to their itinerary. It's time to share our Olympic City with them. What a more perfect day than to celebrate with our British royalty. The headlines state that they are looking to visit Canada for canoes, campfires and cookouts. Will they be in the Rockies, the beaches of Prince Edward Island? We welcome them to a uniquely Canadian setting. This is the one special holiday of the year that marks the beginning of summer vacation for many families. Many families will be packing up their campers, pets, families, and friends which will travel to the interior of BC in hopes of finding warmer weather. We pray our blessings for safety for all our families travelling this weekend. So be aware if any of you spot this Royal Couple on your vacation this weekend. 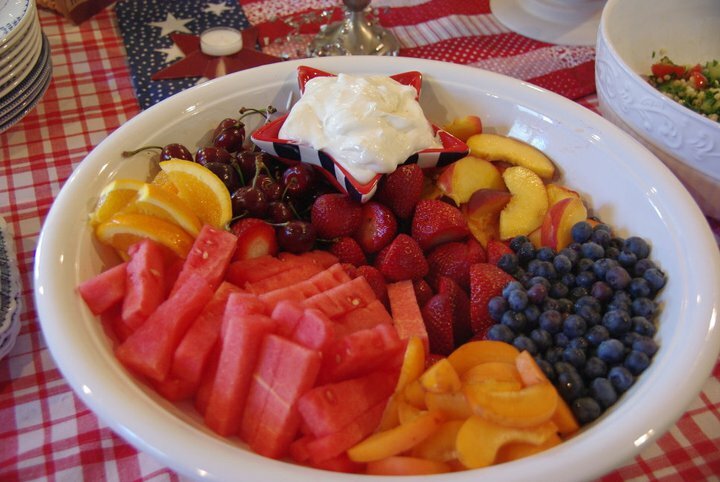 So, today I've chosen a salad that will drape the colors of our flag, and compliment any Canada Day celebration meal. This is a rustic salad using a few simple ingredients. On a large platter, arrange the washed salad greens, and add halved cherry tomatoes. Placed bocconcini mozzarella balls evenly on top of the tomatoes. Sprinkle torn basil leaves over the salad. Add freshly ground pepper and drizzle with balsamic vinegar and oil mixture. Balsamic vinaigrette consists of 1/2 cup virgin olive oil, 1/4 cup balsamic vinegar. Add one clove garlic minced and salt and pepper to taste and whisk together. It's Canada Day and we started celebrating with family last night. 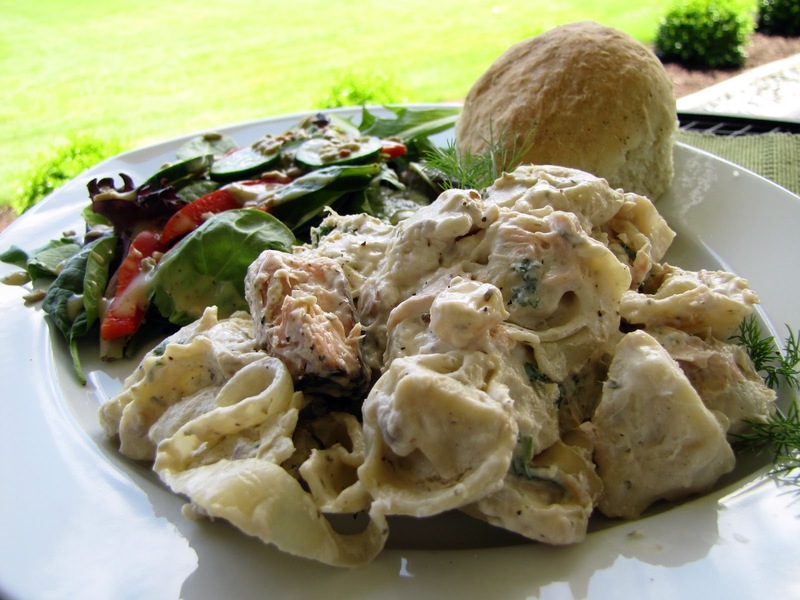 We added some freshly cooked salmon and halibut, with freshly grilled potatoes, freshly baked biscuits and rhubarb platz with ice-cream. Enjoy and celebrate this wonderful country of ours. We have so much to be thankful for.